This is another item I baked on Anzac day. Coles was selling good quality chocolates nearing to expiry. 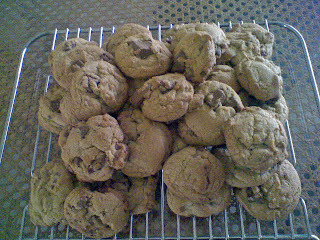 And I personally think a chocolate chunk cookies would taste heaven rather than chocolate chip cookies. Big pieces of chocolate chunks is the way to go! Crispy at the edges, chewy at the center. Do try it out! 1) Preheat oven to 190°C and line baking trays with baking paper. 2) Mix Portion A and set aside. 6) Scoop out a heaped spoon of batter with ice-cream scoop onto prepared tray. 7) Bake for 10mins until slightly browned. 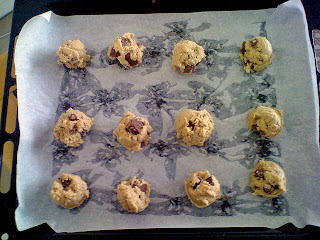 Cookies cooling on wire rack. *I was impatient and tried transferring real hot cookies onto wire rack and they were so soft that they brittled and wouldn't hold its shape. So, just leave it in tray for 10mins and don't touch it! Yield about 30 1-inch in size cookies. 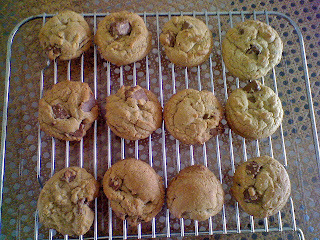 0 comments on "Baking Marathon- Chewy Chocolate Chunk Cookies"